Contrary to what current popular culture may lead you to believe, cross-dressing is not something that started with the MTV generation. It has been a part of the cultural landscape for thousands of years. One of the earliest recorded examples of cross gender activity I could find was the Pharaoh Hatshepsut, who ruled Egypt in the 15th century BC. During Hatshepsut’s reign, characterized by massive public building projects, Egypt grew wealthy on tribute and trade expeditions to foreign lands. Yet, after Hatshepsut’s death, many of the statues depicting the ruler were destroyed by the next king to ascend the throne. Hatshepsut’s name was also erased from inscriptions that had been intended to commemorate her name for eternity. Yes, her. 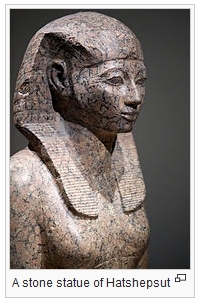 Hatshepsut, a daughter of a pharaoh, ascended the throne as a more or less temporary regent for her nephew. However, Egyptian tradition made no provisions for female rulers at the time. Women could be queens, but not pharaohs. Hatshepsut’s solution to this problem was an ingenious one: She proclaimed herself pharaoh nonetheless, and started wearing the traditional kilt and fake beard worn by male rulers. She also ordered herself to be depicted in statuary wearing those royal accessories. Whether the attempted eradication of Hatshepsut’s name from Egyptian history following her death was a result of her subverting traditional Egyptian gender distinctions is uncertain. It is known however, that she had a male lover, so her transgender nature had more to do with issues of power and royal prerogative than gender confusion or sexual identity. I found this account many years ago and I am not sure of the complete correctness of the account. If you know more let us know. It is interesting story if true.